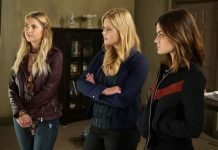 After a few months of rest, returns to the most popular of late teenage mystery, we are talking about the Pretty Little Liars series (Pretty Little Liars) which premieres its new season number 6. The sixth season of small lying, start right where we left off the end of the fifth season . The first 10 episodes of the new season will focus exclusively on the mystery of Charles DiLaurentises and every unanswered question of the mystery of “A” from the beginning of the series, which left fans confused. This season will also include liars school graduates followed with a jump of four years time will happen after the first half of the season. As is usual this time is no exception; the season is divided into two parts. It’s time to say goodbye! The time is coming! After many rumors, it’s official: the seventh season of Pretty Little Liars will be the last of the series. The announcement was made by the creator Marlene King, side of the actresses to Troian Bellisario, Ashley Benson, Lucy Hale Shay Mitchell and Sasha Pieterse for a live chat on the show page on facebook . It was sad? Think on the bright side: the group ensured that all mysteries will be answered (once and for all!) In the final ten episodes. 7A season of Pretty Little Liars ends tomorrow, the 30th, in the United States. The other half of the seventh year will begin airing in April 2017. Patrick J. Adams, boyfriend of protagonist Troian Bellisario, spoke to the press during the ATX Festival, last weekend. Six seasons later, the identity of the mysterious villain (or villain) of Pretty Little Liars, has changed more times so that someone is able to maintain the account. According to new information, however the conspiracy is about to shut down at once, since the end of the series may be very close. Although he said that there is the possibility of Pretty Little Liars coming to an end, it was the first time someone spoke openly about it.